We were 18 and had started dating just after we graduated from high school. I found out I was pregnant during my first semester of college in Boston, but he was still living in New York. We had way too many goals and aspirations to let this ruin our lives. He drove up to be with me during the procedure. I was made to feel like I should be ashamed of what I did. Ashamed of making this decision, and I cried. But it was a good decision. I don’t feel ashamed anymore. I was 16 and IN LOVE. We spent one night together and the next day he got on a plane and left for good. Later, I caught mono and had lab work which also showed I was pregnant. The doctor called my dad. My dad told me I was pregnant. I said I wanted to end it and he said he’d take me and he did. It was the right thing to do for me at that time. Dad NEVER mentioned it after that day…….ever. It was over. No regrets! 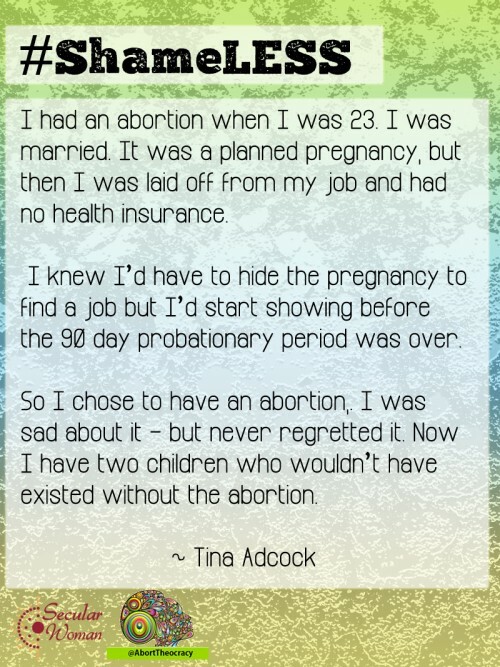 I had an abortion when I was 26. I was not using birth control since I had not been in a relationship in quite some time. I met someone and it “just happened,” to borrow from an old cliche. The relationship was less than a month old. I was living on a shoestring with a job that was looking less stable all the time (my position ended up being eliminated a couple of years later). We talked about what we should do. We both agreed that an abortion was probably the best route. I never regretted it. And now, many years later, I am thankful that I did not go through with the pregnancy since the man I was involved with proved to be an unreliable person in various ways. I also realize that I was not ready to be a good parent back then. I was too selfish and my struggles would have negatively affected my child. I believe what I did was right for me and my situation at the time. I think all women should be given options, to be able to make these choices for themselves, and not have to face shame due to someone else’s belief system. I married at 17, had a daughter at 18 and a son at 19. My husband was physically and emotionally alcoholic. When I was 21, he entered the hospital for a six-week alcoholic rehab and we tried to heal our family. Unfortunately, we found ourselves pregnant. The financial and emotional stress would have been too much and likely would have destroyed our family. We decided that the well-being and stability of our existing children outweighed that of our potential child and we terminated the pregnancy. This was the best decision we had ever made and I have never once regretted my abortion. 25 years later he is still sober and our two children are happy, healthy, productive people. Ten years ago I was in a relationship with a man with whom I’d never want to have children. Good looking, great in bed, but immature and not always reliable. I was seeing him for few months and we always used condoms… but one time one of them broke. I was constantly working around that time and didn’t manage to get a morning after pill in time. I didn’t worry much though. It was the first and only time I had any problems with condoms, it wouldn’t happen, right? If I had financial resources to keep the pregnancy I would never tell the guy about the positive test and do just that… I didn’t, I couldn’t afford the abortion, but in just a few short months as my immigration status was due to change I could get it on the NHS. The wait was very painful. 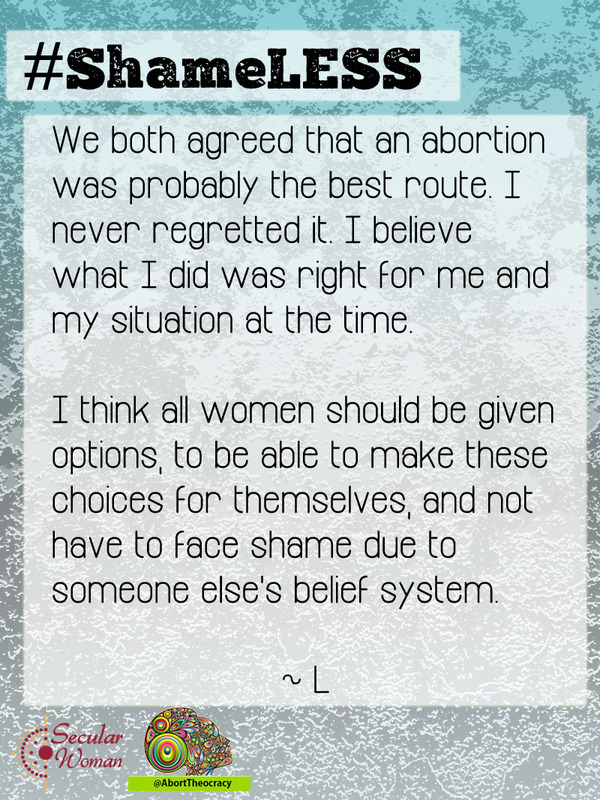 The closer to the abortion, the less I “wanted” it and the more it became something I was forced to choose. Three months felt like three years. On the day of the procedure was scheduled I felt very scared. I never wanted anyone to know and had nobody to talk to. I made my way to Marie Stopes clinic for my appointment and once I arrived I felt a bit more calm. Finally I was not the only one who made that choice and not the only one who waited that long. 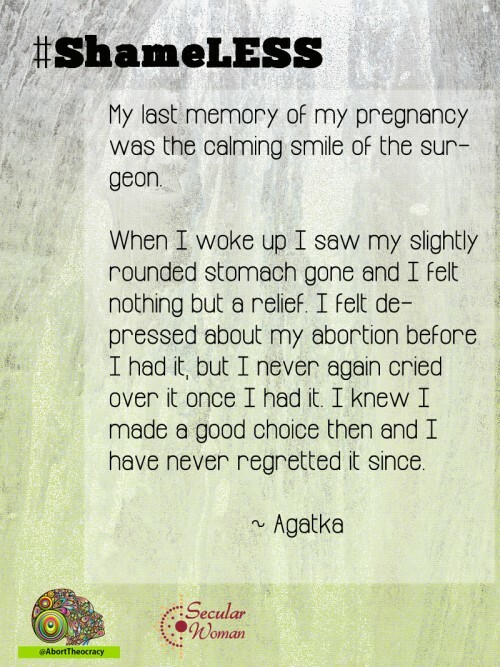 My last memory of the pregnancy was the calming smile of the surgeon. It was an elderly African man with silver hair and happy face. When I woke up from the anaesthetic I saw my slightly rounded stomach gone and I felt nothing but a relief. 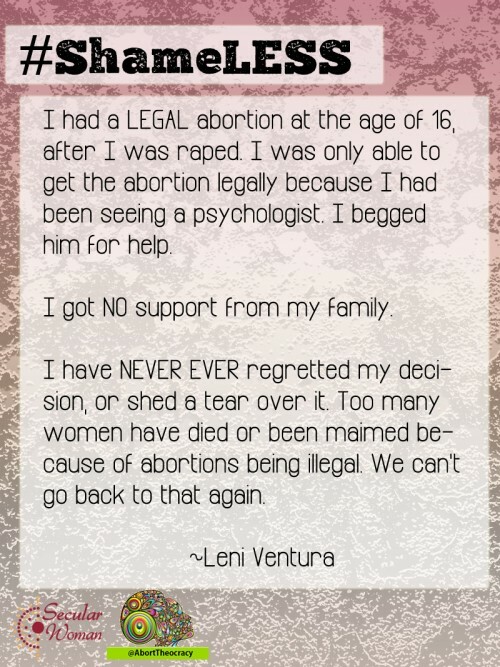 I felt depressed about my abortion before I had it, but I never again cried over it once I had it. I knew I made a good choice then and I have never regretted it since. Not long after the procedure I met a man who was different from anybody I had ever met. It’s been nine years and now we made a choice to try for a baby. If I was denied my choice all these years ago I would not have the opportunity to make this choice now. It would be one more poor child with one parent and one less happy family. 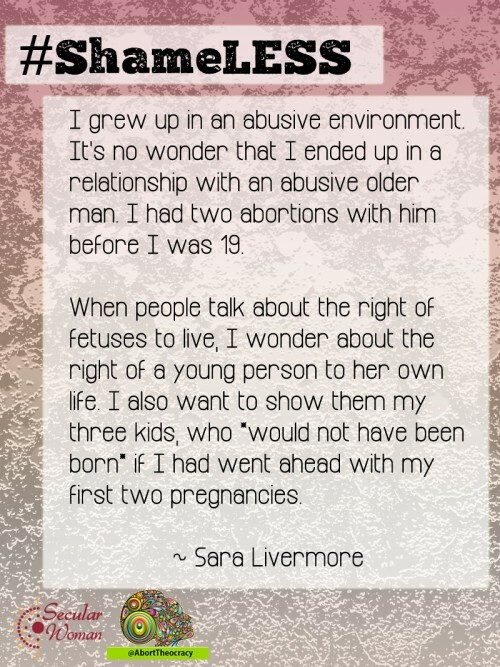 I had an abortion when I was 23, back in 1996. I was married, and it was even a planned pregnancy, but then I was laid off from my very good job with very good health insurance. I knew I’d have to hide being pregnant in order to find another job, but I also wouldn’t be out of the 90-day probationary period by the time any employer found out, and I could easily be let go. The thought of being pregnant without health insurance (COBRA premiums have never been affordable) was incredibly stressful, as well. So I chose to have an abortion, just under the maximum gestation allowed. It was better than bringing a child into the world to such young parents in such a stressful situation. I was sad about it – but never regretted it. I had my daughter in ’98, and then my son in ’04. They wouldn’t exist if I hadn’t had the abortion, and I can’t imagine life without them. I’ve been able to do a lot in life that I couldn’t have done by having a baby at 23 years old, and it irritates me to no end when I see something that misleads women into thinking having an abortion will ruin their life. It only will if you let it. My abortion improved my life, plain and simple. The law forced me to see a psychiatrist first, as if I had a mental disorder. My doctor asked if I had let "the boy" know I was pregnant. "My husband? ", I asked? "The boy. ", replied the doctor. "Are you referring to my husband?" "Look, you know how it works. There was a boy involved." How rude of the doctor to not acknowledge I became pregnant by my husband. My doctor tried every way he could to get me to tell him the personal details behind my circumstance and decision, as if he was somehow authorized to pass judgment. People used to spread the belief that every woman having an abortion would years later suffer horrific pain at what she had done. It’s been 41 years and I haven’t had that happen yet. I’d make the same decision today. 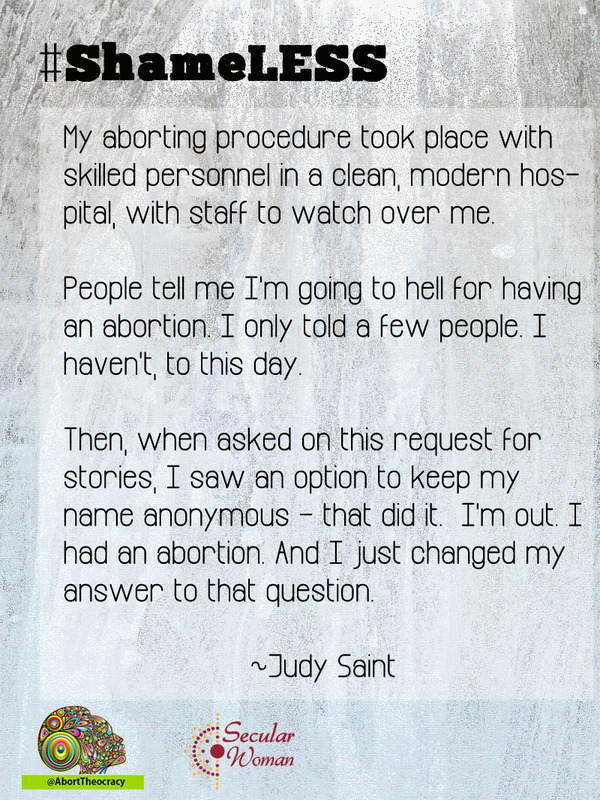 My aborting procedure took place with skilled personnel in a clean, modern hospital, with full staff to watch over me afterward. Not all women have that option. That’s sad. And deadly. People telling me I murdered a person seems odd to me. I mean, little impregnated clumps are sloughed off by a woman’s body naturally all the time, and no one holds a funeral over the toilet bowl each month, just in case the egg was fertilized. People tell me I’m going to hell for having an abortion. People tell me I’m going to hell for (years later) having artificial insemination from a donor. People tell me a lot of silly things. It seems more related to their need to control than caring about my life. Oh, I didn’t tell more than a few people. I haven’t, to this day. Then, when asked on this request for stories I saw an option to keep my name anonymous – that did it. I’m out. 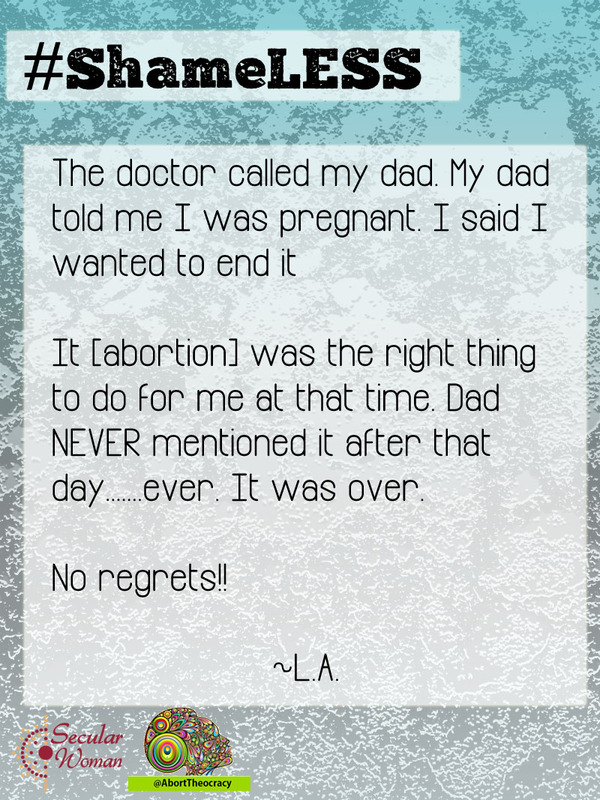 I had an abortion. And I just changed my answer to that question. I don’t feel shame, only pity that people can’t share more about their lives because of church biddies with waggling tongues.